It’s hard to believe – considering Francesco’s prowess on the subject – but I’ve never posted a risotto recipe before now. I think I may have mentioned once or twice that risotto is not really my bag, but to completely withhold the secrets of an authentic, Northern Italian risotto, well, it just wasn’t fair. And now that I’ve found a risotto that I can stand behind, there’s no excuse. 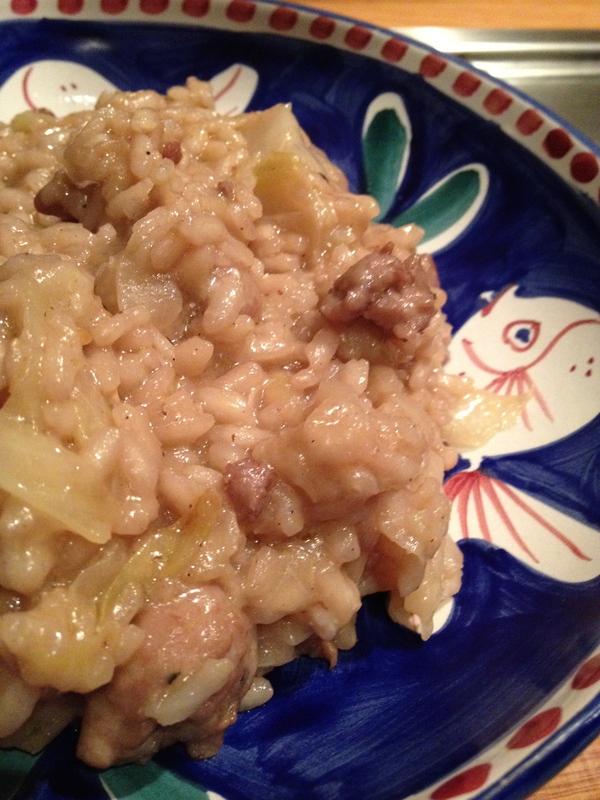 Risotto con cavolo e verza is, without hesitation, my favorite risotto. While the whole family convened in Boston over the winter, my brother-in-law Nicola whipped it up using the skills he’d acquired while living in Udine, a gorgeous little city in the far northeastern corner of Italy. I watched, recorded, and pretty much stole his skills. Now I know the secrets. The little details that, I think, make all the difference. And herewith I share them with you. First secret: the rice. All of us non-Italians think arborio when we think of risotto. This, I’ve been told emphatically, is not the correct rice for risotto. Rice pudding, sure. But if you can find it, use carnaroli or vialone nano for risotto. I cannot tell you why, exactly – they look all the same to me – but I wouldn’t bother questioning the risotto gods on this one. Second: the broth. Everyone knows that you have to stand over the stove stirring constantly lest your risotto stick to the pan, cook unevenly, haunt you in your dreams, etc. But I didn’t know that you should have it simmering on the stove, so that your ladlefuls of broth do not chill the risotto and hamper its progress. Also, I should note that the way I’ve seen Italians do it, they add much smaller quantities of broth at a time and let the rice get quite dry before adding more. Do I know why? No. But it doesn’t matter why when the risotto comes out as good as it will. Third: the ingredients. This may go without saying, but using good (plain pork) sausages really does make a huge difference. I tried to use normal Australian “bangers” and…yeah. Not so much. You don’t need to go gourmet, just ask the butcher (or check the package) to see if there are lots of additions in the sausage. The less the better. Plain Jane good-quality sausages will make this sing. Third: the mantecatura. This, ladies and gentleman, is the most important secret of all. This is where the risotto goes from elaborate rice to otherworldly. Here’s what mantecatura entails: when the risotto is al dente, remove it from the heat and throw in some chunks of butter and grated Parmesan. Stir ever so slightly, just enough to fold but not enough to completely combine, and then cover and leave it alone for 5 minutes. The result is a creamy dream of a risotto – the butter and cheese have melted but not enough to be totally lost in the mix. Makes 4 ample servings and takes about 1 hour start to finish. In a very large pot, heat a fair few glugs of olive oil on medium-low and add the shallots, cooking for 5 minutes until transparent. Now crumble in the sausages in bite-sized pieces and add the cabbage. Turn up the heat to medium and cook, stirring with a wooden spoon for 10 minutes or so, until the cabbage is wilting and the sausage is no longer pink. Add the rice and stir; cook for a few minutes, stirring every once in awhile. Now get your broth simmering on the side. Here’s a good time to pour yourself a big glass of wine. While you’re at it, pour 1 cup of red wine into the pot; cook for a few minutes, until the wine seems to have been soaked up. Now add one ladle of broth and cook, stirring well every minute or so, until the broth has disappeared. Add another ladle of broth and repeat. Keep doing this for about 20 minutes, then begin tasting the rice to see if it’s al dente. Grate some black pepper in if you like. Keep adding broth, stirring, and letting the broth disappear before adding more, until the rice is al dente. At no point should it be runny or wet. When the rice is cooked to your liking, remove the risotto from the heat. Scatter the butter and grated cheese into the risotto and using big, folding movements, just combine. Cover the pot and don’t touch it for a few minutes, during which you make sure everyone is ready to eat. Serve the risotto immediately with the rest of that red wine – and hopefully some more – and enjoy! Just made this last night – it was fantastic. The rice (I used vialone nano) does make a difference! Who knew?